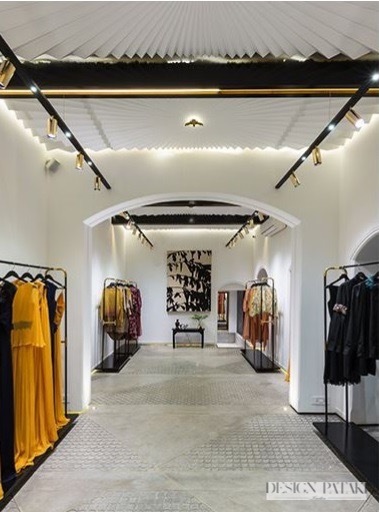 One of the greatest architectural challenges can be creating a space that effortlessly straddles eras but in the heart of Kolkata’s commercial centre stands a building that evokes the best of modern design while paying homage to the years gone by. 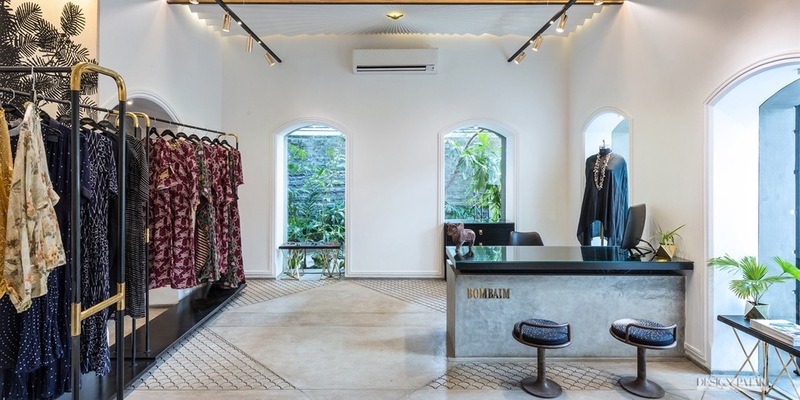 Bombaim is a contemporary boutique in Circus Avenue, but being set up in a heritage building over 100-years-old it was in need of a bit of an update to match its current identity. 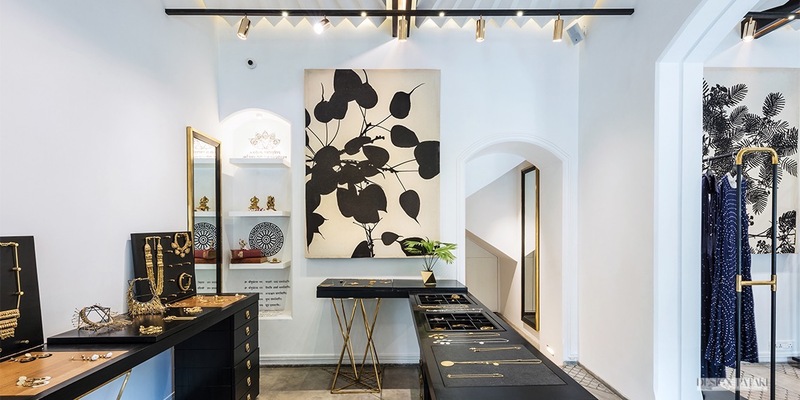 During the process, however, owner Richa Kanoi and lead architect Animesh Nayak – founder of design firm Open To Sky Architects – wanted to bring the space into the 21st century without compromising on the classic antique elements that gave the building its unique character. Of course, working with older buildings comes with a unique set of problems, be it cracked foundations or termites, a structure can fight modernisation every step of the way. Animesh and his team took a lot of care to work with the existing framework, preserving the high front-facing archways which they fitted with frameless glass and French grills to allow ample natural light into the 1,000 square foot space. They also decided to accentuate the existing ceilings which towered at 12 feet with custom-designed relief panels that were hand-carved in-situ with a starburst pattern. Brass Elements used for the Accessories. These ornate ceilings contrast the more industrial polished cement floors which are inlaid with poured brass and scallop patterning. The complex ceilings and laser cut flooring are the main focal points of the architecture while the rest of the space maintains a neutral colour palette and minimalist aesthetic. There are occasional pops of colour in the form of the many pieces of art that adorn the space, created by Tilla, the prints depict various plants and trees native to Kolkata and bring a sense of earthiness to an otherwise modern space. This works well with Open To Sky’s personal design ethos, they like to include as many handmade, craft elements in their projects. 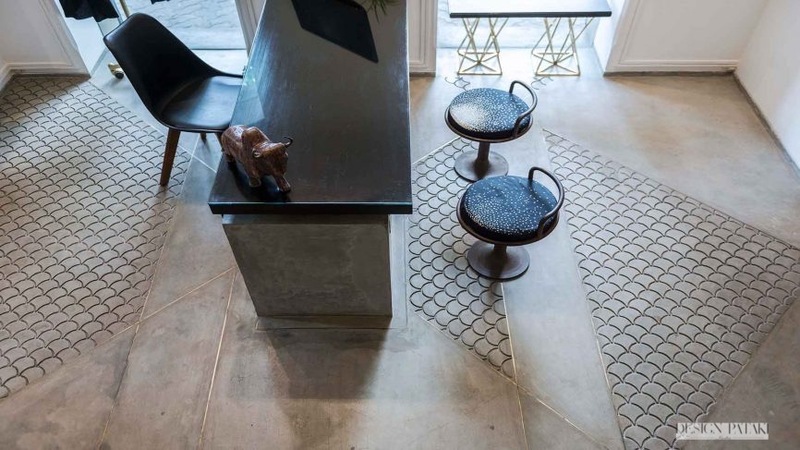 The scallop pattern in the concrete floors is an elegant take on industrialism. A more detailed top view of the scalloped pattern. There are also repeated elements of celestial bodies, from the hand-painted constellation mural to the fabric used on their stools, the accents of gold in these pieces continue through the light fittings and display racks which brings a touch of warmth to the room. 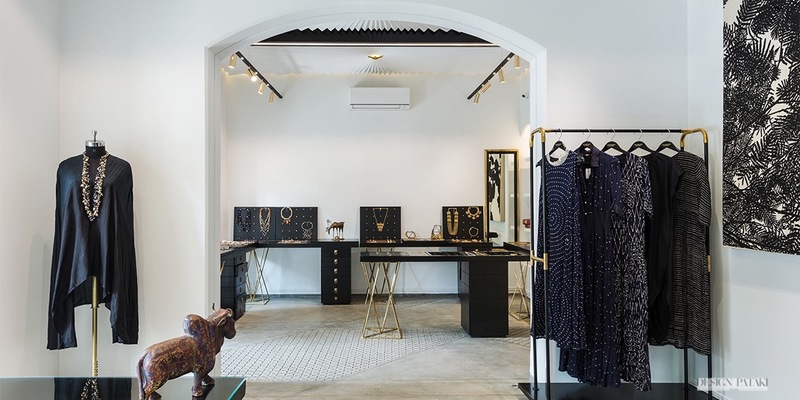 Though primarily a shop, Bombaim carries a sense of serenity, one where the old and the new co-exist peacefully. The rooms flow seamlessly from one to the other creating the illusion of a single open space that is broken only by the intriguing alcoves and curiosities that steal your attention. Bombaim is a shining example of how architecture can continue to progress without decimating the beauty of the past. Photographs courtesy Open to Sky Architects.